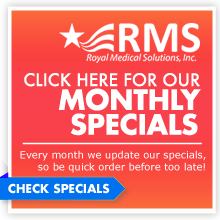 You may check on your order by sending your request by email to: sales@royalmedsolutions.com or by calling our toll free number: 1-855-342-6230. What if I do not like the product that I have ordered? Please review our Return Policy posted on our website, as some products are non-returnable. Otherwise, returns must be done within 7 days of receipt of product; must be in their original packaging along with all parts, warranty, instruction information, and must be unused. You are responsible for paying the return shipping charges. Our restocking fee is 25%. What if my order arrives and the packing materials are not damaged, yet the product does not work properly? If you receive a product that does not work properly, simply call our office or send us an email, and we will gladly pick up the product and issue you a refund or reship another product per your request. We will gladly have the product picked up at no cost to you, and issue a refund or reship the correct product as per your request. Call our office using our toll free number: 1-855-342-6230. What if a product arrives that has obvious damage? Products are very costly to ship, and it is very important that our customers are aware of our policy concerning their purchase. If a product has been delivered, and it is obvious by visible inspection of the box, that there may be damage to the product, it is up to you to address the issue with the delivery company. You should refuse the shipment so the freight company will return the product back to us. A replacement will then be shipped to you. If there is no visible damage to the box, and you later discover that there is concealed damage, again, this is an issue to take up with the carrier. It is very important that you keep all of your delivery receipts and packing slips and contact the carrier within the carrier’s required time limit. If you have questions, please call our office at our toll free number: 1-855-342-6230. Are there any special or additional shipping charges? Some of our larger items may have optional delivery or set-up fees. We will contact you regarding those options. Products that are heavy or oversized, and large orders may require additional shipping charges. Do you have products other than those shown on your website? Yes, we have many products available. We invite you to call our office, and we will be glad to assist you. How do you determine the weight capacity of a cane? Cane strength weight supported: is X, this means when a cane is used properly it should support a user who weighs X amount of pounds. What do we mean when we say used properly? Walking canes are not meant to replace crutches, nor are walking canes meant to support all the weight your leg normally would support. Walking canes are intended to provide a third point on the ground for balance and give some weight support. So, if we say a cane can support 250 pounds we mean when used properly for balance and some support. If the user is larger than the supported weight rating and only uses the cane for balance then it should work for them. Another example is if the user weighs less than the supported weight rating and puts too much of their body weight on the cane, more than likely the cane will fail. Always consult your doctor in matters concerning using a walking cane. None of the information on this page should in anyway replace medical advice from your doctor or therapist.